DELANO — Delano is hoping to use Friday night’s home-opener to get in the win column for the 2018 season. 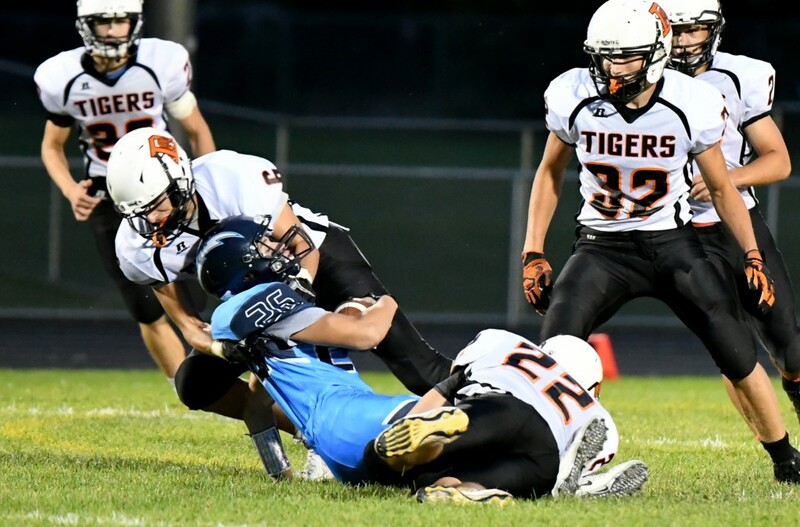 The Tigers host the Flyers of Little Falls, who are in the same situation, in search of a win following an opening-week loss. Delano enters off a 37-19 loss at Zimmerman, where the Tigers out-gained the Thunder but turned the ball over five times. Little Falls enters the game at Delano off a 48-18 loss at home to Dassel-Cokato. The Flyers, too, were hurt by turnovers. After viewing the Little Falls game tape from opening week, Delano coach Merrill Pavlovich saw a lot of what he saw in person at Zimmerman. Delano’s Isaiah McManus (6) and Caden Link (22) take down Zimmerman’s Jake Pool during the Aug. 30 game in Zimmerman. McManus, Link and the rest of the Tigers host Little Falls tonight in the home-opener. “Missed assignments and mistakes, much like Delano experienced in our first game,” he said. Also like Delano, Little Falls was plagued by poor field position and turnovers in the second half. Dassel-Cokato took two interceptions of Flyers quarterback Austin Udy to the end zone for touchdowns in the third quarter. 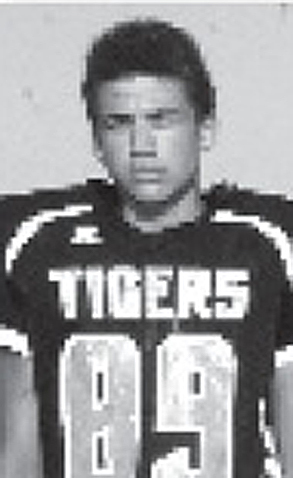 In the game at Zimmerman, Delano gained 349 yards of offense against an athletic Thunder defense. Thirty pass attempts is more than the Tigers like to throw the ball, historically, but the path of the game forced Delano to go to the air, especially late, when the Tigers trailed in the game. Delano rushed for 122 yards. Senior Sam Kern claimed most of those yards, rushing for 96 yards on 14 carries. Senior fullback Caden Link scored Delano’s only rushing touchdown. While the outside passing game and the speed rushing of Kern are something to worry about, Little Falls coach Joe Bartos expects a challenge from Delano inside. Delano’s defense played well at Zimmerman, but also gave up several big plays that led to touchdowns. Zimmerman got behind the Tiger defense for gains of 56 and 55 yards on two runs. The Little Falls defense seemed to tire against Dassel-Cokato. The Chargers scored 7 points in the first quarter, 13 in the second, and 28 in the third. Of course, two of the touchdowns given up were the fault of the Flyers’ offense, via those two interceptions. Pictured here in his sophomore season as a Delano Tiger, Isaiah Sloan is now the tailback for the Little Falls Flyers, the team Delano will host Friday night. The Flyers’ 3-4 defense gave up 436 total yards to the Chargers, including 156 yards and three touchdowns on the ground and 280 yards and two touchdowns through the air. Little Falls did force and recover four fumbles against Dassel-Cokato. Running a pro-style system, the Flyers’ offense gained 187 yards of total offense against Dassel-Cokato. They ran for just 50 yards on 29 rushes (1.7 yards per carry), and threw for 137 yards and three touchdowns. Two of Udy’s touchdown passes went to Luke Kush, both from 14 yards out. Udy hit Grant Like late in the fourth quarter for his third touchdown pass of the game. “Impressive receivers,” Pavlovich said of Little Falls. Little Falls’ leading rusher was someone Delano knows well, Isaiah Sloan, who played for Pavlovich and the Tigers a season ago. Sloan ran the ball 19 times for 53 yards. He wears jersey No. 11. The scenario heading into Friday night’s meeting between the Tigers and Flyers mirrors the Week 2 situation a year ago, when both teams were coming off an opening-week loss to the same two opponents. The visiting Tigers claimed the game last season at Little Falls, 37-6.